In 2010, DNR received a $1 million grant from the U.S. Forest Service to perform a statewide forest biomass supply study. The University of Washington School of Environmental and Forest Sciences, with TSS Consultants, won the competitive award to perform the study. The grant is, in addition to the supply study, enabling DNR and partners to test methods for making forest biomass material available from broad, multi-landowner areas. The aim is to improve the economic feasibility of protecting forests from wildfire and restoring forest health. The study reports the contributions of forest-based biomass as a byproduct of sustainable forest operations to economic development within economic, technological, and ecological constraints. Three major goals were accomplished with the study. First, an estimate was produced of the volume of forest biomass, stratified by landownership categories, forest ecosystem types, species and location (whether it was removed or retained on site). Producing stratified biomass data led to the development of a spatially explicit biomass database. Second, the study assesses biomass availability based on various cost and price considerations, market prices and calculating residual value to the landowner. Third, public to access the biomass database is provided through the internet via a web-based calculator tool. 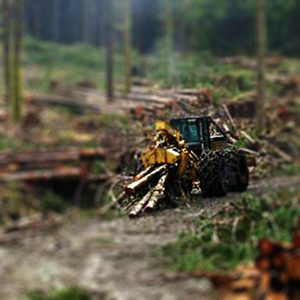 The research team studied the process of biomass production beginning with a forest harvest operation. The team calculated the volume of biomass at all stages of processing and inferred the contribution it makes to market uses and ecological function when it was retained on site. The study also produced an estimate of pre-existing woody material based on references and studies in existing literature. The report also studied alternative scenarios regarding fuels treatment and forest health in National Forests in eastern Washington. The scenarios reflected a future that increased the number of acres treated for fuels reduction and forest health reasons, and calculated the volume of biomass produced as a result of these treatments. This figure shows the allocation of material from a forest harvest operation into merchantable stem volume and biomass starting from left to right. Biomass on a parcel began as the volume of slash that was produced as a byproduct of a forest operation. Biomass was everything generated as part of the timber harvest process including tops, live/dead branches, and foliage, and included breakage and defect associated with stem volume. This biomass was classified as post-timber harvest biomass. Post-timber harvest biomass was then allocated to either potential market or non-market uses. The biomass that was brought to the landing and roadside was calculated and recorded in the biomass database as harvested biomass. The volume that was left scattered in the woods as a product of having been broken off or tops and limbs cut when commercial logs were yarded to the landing was noted as residual harvested biomass. Biomass that reached the landing and roadside was filtered by operability constraints for each ownership and forest type, and became either potential market biomass or residual potential market biomass. The potential market biomass represented the amount that could be potentially loaded onto a truck. The residual potential market biomass was the portion that did not get loaded due to operability constraints (equipment cannot be brought in) or other factors such as landowner preferences (the landowner does not want to sell their biomass). The potential market biomass was the volume that was subject to market valuation and was furthered filtered by economic parameters. Market biomass was the portion of the potential market biomass that actually was loaded on a truck. Some market residual was produced when costs considerations were included. This residual was noted as residual market biomass. The accounting was complete when the volume of biomass reaching the market was recorded.